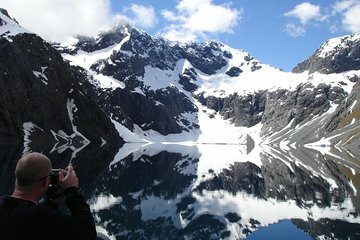 Tour Milford Sound from the air and indulge in a gourmet picnic at an alpine lake suspended above Fiordland. This 4-hour helicopter tour provides the ultimate adventure in the sky, flying you past the snow-capped peaks of the Southern Alps. Experience several landings with time to stroll on a deserted beach. Listen to your pilot’s narration about ancient glaciers and prehistoric rainforests as you soak up the dramatic scenery. Book on a shared helicopter, or upgrade your experience to a private charter exclusive to your group. Gourmet Beverage hamper including Champagne, NZ Beer, bottled water, juice and soft drink.